Transposable elements (TEs) have been consistently underestimated in their contribution to genetic instability and human disease. TEs can cause human disease by creating insertional mutations in genes, and also contributing to genetic instability through non-allelic homologous recombination and introduction of sequences that evolve into various cis-acting signals that alter gene expression. Other outcomes of TE activity, such as their potential to cause DNA double-strand breaks or to modulate the epigenetic state of chromosomes, are less fully characterized. The currently active human transposable elements are members of the non-LTR retroelement families, LINE-1, Alu (SINE), and SVA. The impact of germline insertional mutagenesis by TEs is well established, whereas the rate of post-insertional TE-mediated germline mutations and all forms of somatic mutations remain less well quantified. The number of human diseases discovered to be associated with non-allelic homologous recombination between TEs, and particularly between Alu elements, is growing at an unprecedented rate. Improvement in the technology for detection of such events, as well as the mounting interest in the research and medical communities in resolving the underlying causes of the human diseases with unknown etiology, explain this increase. Here, we focus on the most recent advances in understanding of the impact of the active human TEs on the stability of the human genome and its relevance to human disease. Transposable elements (TEs) occupy almost half, 46%, of the human genome, making the TE content of our genome one of the highest among mammals, second only to the opossum genome with a reported TE content of 52% [1, 2]. The total representation of TE-related sequences in the human genome is probably even higher, as many of the sequences of the most ancient TEs have deteriorated beyond recognition . The human genome contains two major classes of TEs, DNA and RNA transposons, defined by the type of molecule used as an intermediate in their mobilization. DNA TEs encode a transposase that re-enters the nucleus to specifically recognize transposon sequences in chromosomal DNA. The transposase excises these sequences from their genomic location and inserts them into a new genomic site (reviewed in ); this is also referred to as 'cut and paste' transposition. Human DNA TE activity subsided over 37 million years ago ; as a result, DNA TEs no longer contribute significantly to the ongoing mutagenesis in humans. Retrotransposons or retroelements make use of an RNA-mediated transposition process. Retroelements are subdivided into two major groups: those containing long-terminal repeats, LTR retroelements, and all others, lumped into the category of non-LTR retroelements. Although inactive in humans for millions of years, the best known LTR retrotransposons, the endogenous retroviruses, make up approximately 8% of the human genome . This contrasts with rodent genomes, in which LTR elements continue to contribute a high proportion of the germline TE-associated mutations (reviewed in ). Non-LTR retrotransposons include autonomous and non-autonomous members. The autonomous long interspersed element-1 (LINE-1 or L1), and its non-autonomous partners, such as 'SINER, VNTR, and Alu' (SVA) and the short interspersed element (SINE) Alu, are the only mobile elements with clear evidence of current retrotrans-positional activity in the human genome  and will therefore be the primary focus of this article. The human L1 is about 6 kb long and encodes two open reading frames, ORF1 and ORF2, which are both required for L1 retrotransposition (Figure 1a) . ORF2 encodes endonuclease and reverse transcriptase activities that are crucial for the insertion mechanism [8, 9]. SINEs and SVA elements do not encode any proteins , instead they depend on the presence of the functional L1s, and they are therefore often referred to as L1 parasites . In contrast to L1, Alu elements require only ORF2 of L1 for their mobilization [11, 12]. Alu elements are transcribed by RNA polymerase III and encode a variable length adenosine-rich region at their 3' end, a critical feature for retro-transposition . SVA is a composite element containing a complex sequence composed of a (CCCTCT)n hexamer repeat region, an Alu-derived region, a variable number tandem repeat (VNTR) region and a retroviral-derived sequence (Figure 1a) . The requirements for SVA mobilization are still poorly understood [13, 14]. L1 expression leads to different types of DNA damage. Schematic structures of an SVA element (labeled SVA), showing the CCCTCT repeat, the Alu-derived (A-like) region, the variable number tandem repeat (VNTR) region, and the long terminal repeat (LTR)-derived region; an Alu element (labeled Alu (SINE)), showing left (purple) and right (pink) halves separated by the A-rich region (A) and the variable length A-tail ((A)n) followed by the 3' region (white), which has a variable length and sequence; and an L1 element (labeled LINE-1), showing open reading frame (ORF)1 (light blue) and ORF2 (dark blue) and the 5' untranslated region, inter-ORF region and 3' untranslated region (white). (a) The typical insertion of these elements into the genome, which can lead to insertional mutagenesis. (b) Dispersed repetitive elements such as Alu elements can undergo non-allelic homologous recombination, which can cause a deletion (shown) or duplication (not shown). The dashed arrow indicates the potential site of DNA damage by an L1 endonuclease that may help initiate these recombination events. (c) Potential outcomes of the repair of the L1-induced double-strand breaks (DSBs). The L1 recognition site is in black; surrounding sequence is in blue; inserted nucleotides are in red. The associated changes are typical of what might be seen with repair of the DSB by non-homologous end joining. It is also possible that the sites are simply re-ligated with no mutation occurring, or alternatively, these sites may cause recombination, as shown in (b). TE activity has often been assumed to be confined to the germline, early embryogenesis, and potentially cancer cells [15–18]. The most recent reports indicate that expression of L1 RNA (VP Belancio, A Roy-Engel, R Pochampally and P Deininger, personal communication) and L1 protein  occurs in human somatic tissues and that somatic L1 retrotransposition takes place in transgenic mouse models [19, 20]. Interestingly, L1 transgenic mice show higher L1 mobilization in somatic tissues than in the germline [19, 21]. Other evidence of somatic L1 mobilization comes from a somatic L1 insertion that inactivates the adenomatous polyposis coli (APC) gene, leading to colon cancer . There are currently very limited data on the somatic expression of Alu and SVA elements, and we do not have a true appreciation of the level of somatic insertion that is occurring from endogenous elements. The most obvious form of mutagenesis common to all TEs is the disruption of gene function or regulation resulting from the insertion of new element copies (Figure 1b). The fortuitous discovery of the first known active human L1 was the result of its retrotransposition into the factor VIII gene, causing a de novo case of hemophilia . 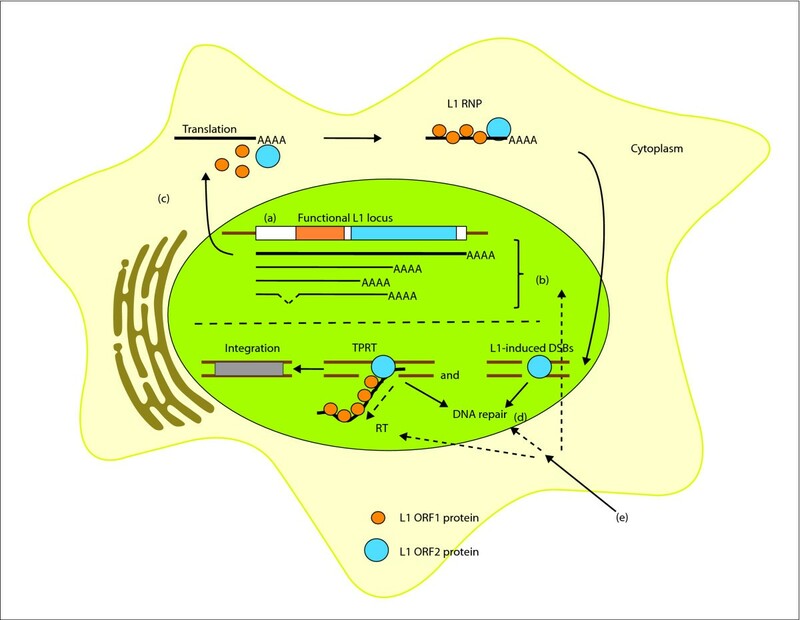 L1, Alu, and SVA are reported to cause a broad range of human diseases (reviewed in [7, 10, 24]). Examples include a diverse collection of diseases, such as neurofibromatosis, choroideremia, cholinesterase deficiency, Apert syndrome, Dent's disease, β-thalassemia, and Walker-Warburg syndrome. Because of the relatively random insertion process, there is great diversity in the type of genetic diseases associated with TE insertions. However, there is a very strong overrepresentation of X-chromosome-linked diseases caused by TEs that could be a result of ascertainment bias (that is, X-linked genetic defects are more easily detected because of the single X-chromosome in males or could also reflect the higher density of L1 elements on the X chromosome). Compilations of the known human diseases attributed to TE insertions (33 Alu, 11 L1, and 4 SVA) are provided in recent reviews [7, 10]. Most of these diseases are due to germline insertions and have been detected as rare recessive diseases. However, some cases of cancers have been identified that are probably somatic mutations in which a TE insertion has disrupted a critical gene, such as BRCA1 and BRCA2 in breast cancer or APC in colon cancer. Almost all of the reported retroelement insertions that cause human diseases have either interrupted the ORF or inserted in close proximity to a splice site, leading to a major disruption of gene function [7, 10]. However, many insertions that do not cause disease may still influence the expression of the genes in which they insert, thus predisposing cells or individuals to disease by slightly changing gene expression. For example, insertion of TE elements might introduce functional splice and poly-adenylation sites [25–29], resulting in aberrant processing of some of the transcripts produced by a gene. In addition, they might introduce regulatory regions that would influence the strength of its promoter, or even add promoter sequences [30, 31]. It has been suggested that L1 elements inserted in the intron of a gene could cause 'gene breaking' [25, 28] that could create proteins truncated from either end, possibly leading to altered functions or dominant-negative effects. In contrast to L1, Alu elements need to accumulate a critical mutation(s) that creates an appropriate functional cis-acting sequence (both splicing and polyadenylation) to have this effect [32–34]. TEs continue to contribute to genetic instability after insertion through non-allelic homologous recombination (NAHR). The presence of multiple closely related sequences throughout the genome facilitates misalignment of repeated sequences, allowing uneven genetic exchange between alleles that contribute to deletions and duplications (Figure 1c; reviewed in [35, 36]). Comparisons of the human and chimpanzee genomes have shown that L1 and Alu recombination deletions caused over a megabase of difference in more than 100 individual deletions [37–39]. Alu elements not only cause deletions, but also seem to contribute to the formation of segmental duplications. A genome-wide set of 2,366 duplication alignments demonstrated the enrichment of Alu elements near the junction between the two duplicated sequences in all cases, suggesting Alu involvement in these rearrangements . These segmental duplications lead to altered expression of the genes located in these regions and result in further instability by promoting non-allelic recombination between duplicated segments, leading to recurrent genetic disease. TE-mediated NAHR (in particular, recombination between Alu elements) contributes directly to a large variety of genetic diseases. The frequency of this type of genetic rearrangement varies depending on the affected gene (reviewed in [35, 41]). 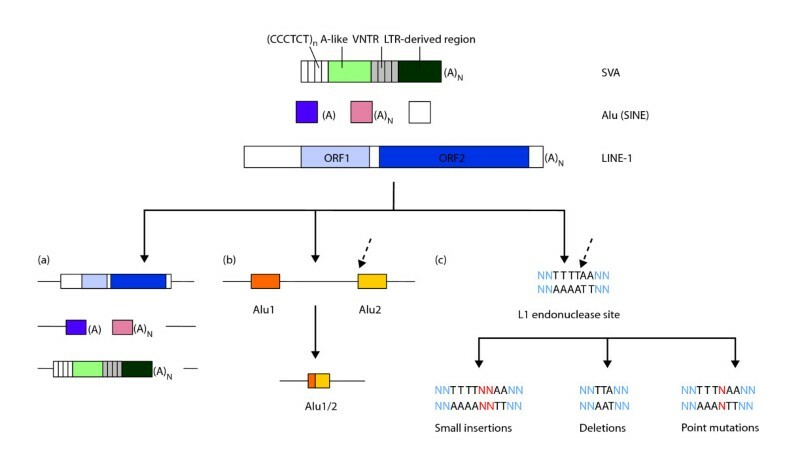 Genes such as MLL-1 (which is involved in acute myelogenous leukemia (AML)) , VHL (von Hippel-Lindau syndrome) , and BRCA1 (familial breast cancer)  seem to be hotspots for Alu-Alu recombination, with a series of independent recombination events occurring with different Alu elements in the region. BRCA1 has 137 Alus in its introns, making up over 40% of its gene sequence. Studies of BRCA1 mutations have shown that, in 23 different individuals, 44 of these Alu elements were involved in duplication/deletion events in this gene. VHL is also subject to extensive Alu-Alu recombination, with almost a third of its germline mutations resulting from large deletions, and 90% of the mapped events involving Alu-Alu NAHR . Of 30 Alu-Alu recombination events mapped, seven involve one particular Y-subfamily Alu element recombining with other Alus in the gene. The Y-subfamily is young and therefore shows lower than average divergence relative to other genomic Alus, which might explain its high recombination rate. Similar observations implicating a particular 'hotspot' Alu element were reported for multiple cases of rearrangements in the LDL receptor gene causing familial hyper-cholesterolemia , and also for the SLC7A7 gene, where one Alu accounted for 38% of all rearranged chromosomes in patients with lysinuric protein intolerance . The MLL1 gene, which is associated with AML, is often involved in chromosomal translocations causing expression of an oncogenic fusion gene. Of the cases of AML without a visible translocation, seven out of nine cases studied involved a duplication caused by Alu-Alu recombination events in intron 1 and 6, which resulted in a duplication of exons 2 to 6 of the gene . Similar duplications have consistently been found in the blood of healthy individuals , suggesting that these types of recombination events occur spontaneously and regularly throughout the lifespan of an individual. The cellular environment can potentially increase Alu-Alu NAHR. Mutants in TP53 (which encodes the tumor-suppressor p53) increase these Alu-Alu recombination events, possibly contributing to malignancy. Although it is clear that active human TEs contribute to spontaneous genetic diseases, the exact extent of their involvement in this process remains elusive. This uncertainty makes the contribution of TEs to human diseases difficult to assess, for the most part due to the absence of uniform and reliable diagnostic methods. The introduction of PCR technology for diagnostics revolutionized the field of clinical setting, PCR across the exons of a gene and sequence analysis is commonplace. This approach is great for identifying point mutations and small insertion/deletion events, but will detect only small TE insertions very near the exons. Most PCR-based tests are inadequate for the detection of the large deletions, rearrangements, and duplications often associated with TE-induced mutagenesis. Awareness of this bias led to the use of alternative methods that can detect copy number variations (CNVs), such as long-range PCR, targeted array comparative genome hybridization (array-CGH) analysis, and multiplex ligation-dependent probe assays (MLPAs). These approaches are better at detection of duplicated or deleted exons that occur from Alu-Alu recombination events. New tests using either MLPA or array-CGH are becoming more commonplace, particularly for diagnostics in cancer, and can detect most genomic duplications and deletions but not larger TE insertions. Traditional Southern blot analysis is still one of the few robust methods for detecting large TE insertions but it is rarely used in diagnostic tests today. The fact that the majority of sporadic human diseases have a subset of cases of unknown etiology leaves a possibility that TE-induced DNA damage may be responsible for at least some of them. In fact, genomic analysis by methods specifically targeting potential involvement of TEs in the sporadic human diseases revealed that a significant proportion of them are, indeed, caused by TEs . One of the most promising technologies for characterizing all of the TE-based variation with minimal ascertainment bias is the potential usage of some of the upcoming next-generation DNA sequencing approaches for random sequencing of the entire genome of an individual. However, this approach is still some years from clinical usefulness. Recent publications from several laboratories have reported the formation of DNA double-strand breaks (DSBs) associated with L1 expression [49–51]. These DSBs depend on the enzymatic activity of the L1 ORF2 endonuclease domain , and their formation triggers various cellular responses [51, 52], including apoptosis, cellular senescence, cell-cycle checkpoints, and DNA repair responses. DSBs are highly mutagenic and can lead to small deletions or insertions if repaired by the non-homologous end-joining (NHEJ) repair machinery (Figure 1d). L1-induced DSBs may also cause recombination events when repaired by homology-driven repair, potentially leading to large genomic rearrangements (reviewed in ). Homologous recombination (HR) repairs damaged genomic sequence either by using the unaltered counterpart as a template in a gene conversion event or through non-allelic homologous interactions that lead to deletions or duplications between the homologous sequences, as described above for Alu element-mediated NAHR. Given that all L1, Alu, and SVA copies in the human genomehuman are generatedgenetic with targettesting. site duplicationsWithin a that contain an L1 endonuclease recognition site, there are roughly 3 million potential cleavage sites adjacent to these elements that may help them contribute to NAHR-mediated events. Because many L1-endonuclease-mediated events may lack the typical hallmarks of L1 involvement (such as the target site duplications that normally flank mobilized sequences and a run of adenosines), we cannot currently assess the relative contribution of this process to genetic instability. The TE amplification cycle involves complex interactions with various cellular factors and compartments, any of which can be positively or negatively regulated by intrinsic or extracellular environmental factors. The L1 lifecycle and some of its known modulators are depicted in Figure 2. Modulators of the L1 lifecycle. The L1 amplification cycle can be divided into several steps. (a) Transcription. L1 amplification initiates with transcription, and regulation of L1 at this step can be modified by epigenetic modifications, DNA methylation, and recruitment of transcription factors. (b) Before leaving the nucleus, the number of retrocompetent full-length L1 transcripts can be reduced by RNA processing through premature polyadenylation and splicing. (c) Translation. Full-length L1 enters the cytoplasm to be translated, producing ORF1 and ORF2 proteins for retrotransposition. The two proteins interact with the L1 transcript to form an L1 ribonucleoprotein particle (RNP). RNA interference can affect this step. (d) Insertion of a new L1 copy. The L1 RNP reaches the nucleus, where the DNA is cleaved by the L1 ORF2 endonuclease activity. It is proposed that reverse transcription occurs through a process referred to as target primed reverse transcription (TPRT) . The L1 ORF2 reverse transcriptase activity generates the first strand of DNA. DNA repair proteins are likely to be involved in inhibiting the L1 integration step. (e) Effects of external stimuli. Ionizing radiation or heavy metals can affect L1 at multiple steps, such as transcriptional activation or altering DNA repair pathways. Levels of TE activity can vary both because of the polymorphism of these elements between different individuals, as well as variations in epigenetic regulation of TE loci. Even though each human genome averages 500,000 L1 copies, of which about 3,000 are full-length and roughly 200 are potentially functional [1, 53], only a handful of elements have high levels of activity in each genome . The rest have mutated sufficiently to lose most or all retrotransposition potential. All of the highly active elements found to date are polymorphic in the population, with each individual probably having a different assortment of active elements . Because these loci consist of the youngest L1 integration events, they have had the least time to accumulate inactivating mutations and are more likely to remain active. In addition to the presence/absence polymorphism of these 'hot' elements, the same L1 loci accumulate distinct point mutations in various individuals that contribute to the diversity in their potential activity [54, 55]. Thus, there may be as much as several hundred-fold variability in L1 activity in different individuals . Recent advances in understanding of the sequence components controlling Alu activity [56–58] indicate that its retrotransposition is also likely to vary in individual genomes. DNA methylation of the CpG island in the 5' region of L1  is one of the powerful mechanisms controlling L1 promoter activity that minimizes the exposure of genomic DNA to L1-associated damage. The genome-wide hypomethy lation of repetitive sequences observed during malignant transformation unleashes L1 expression that is usually tightly regulated in untransformed cells . Methylation of genomic DNA often triggers specific histone modifications, resulting in chromatin remodeling. The role of epigenetic control in L1 expression has recently attracted significant interest, particularly because little is known about the effects of the intronic or near-genic full-length L1 insertions on the epigenetic state of the affected human genes. Among the multiple cellular pathways influencing L1 expression and activity are DNA methylation, tissue-specific transcription factors (Figure 2a), RNA processing (Figure 2b), and RNA interference (Figure 2c) [25–27, 29, 61–63]. In addition, some cellular proteins greatly influence integration (Figure 2d) of L1 and Alu elements; these include DNA repair proteins, such as the ataxia telangiec-tasia mutated kinase (ATM) and the endonuclease dimer composed of excision repair complementing protein 1 (ERCC1) and xeroderma pigmentosum complement group (XPF) [51, 64, 65], and also viral defense proteins, such as the apolipoprotein B mRNA editing enzyme, catalytic polypeptide-like 3C (APOBEC3) family of proteins [66, 67] (Figure 2). L1 mobilization in NHEJ-negative hamster cells causes the element to lose the endonuclease dependence that it shows in a wild-type genetic background, and it then requires only functional L1 reverse transcriptase to achieve wild-type retrotransposition levels . Because of the diversity of the L1-associated mutagenesis, it will not be surprising if additional DNA repair pathways are reported to modulate L1 activity. Given the multitude of cellular factors influencing L1 activity, it is easy to imagine that polymorphisms or mutations in any of the genes whose function is important for suppressing L1 activity may have an impact on its contribution to genetic instability. One of the most profound examples is the mouse knockout of DNA-methyl-transferase-3-like protein (Dnmt3L), a modulator of de novo DNA methylation in the germline, which results in upregulation of the expression of endogenous L1 and LTR elements that coincides with meiotic catastrophe during spermatogenesis [69, 70]. TE activity is influenced not only by the intrinsic cellular environment, but also by external stimuli (Figure 2e). Ionizing radiation, heavy metals (present in cigarette smoke and workplace exposures), anti-cancer therapies, air pollutants, and DNA demethylation agents can locally or systemically cause increases in endogenous TE activity (reviewed in [50, 70]), potentially leading to new health problems (such as sporadic cancers) or exacerbating preexisting conditions (such as the rise of a more aggressive cancer phenotype). The mechanisms of the environmental influences on human TE activity are only just beginning to emerge as we are learning more about their interaction with various cellular pathways. Some of the environmental factors enhance TE expression by changing the epigenetic state of the genome; others, such as heavy metals, probably exert their effect by influencing cellular enzymes that are important for keeping TE activity at bay. Because of the early stage of this area of investigation, no diseases have yet been directly associated with increased activity of TEs due to exposure to environmental toxicants. However, with the new advances in whole-genome studies, some of these crucial questions are likely to be answered in the near future. TE activity can generate a wide-spectrum of genomic mutations, ranging from point mutations to gross rearrangements with gain of genomic information, as well as interference with normal gene processing and expression after insertion. These mutations contribute to idiopathic human disease. Because of the intimate relationship between L1 activity and multiple cellular processes, it is likely that people with genetic backgrounds that produce defects in any of the pathways influencing the L1 lifecycle are more vulnerable to insult from TEs. Thus, to evaluate the impact of these elements on the stability of the human genome and human disease, it is crucial to take into account their cumulative activity in a specific genetic background as well as the potential modulating effects of the extracellular environment. The increasing ease of sequencing genomes is likely to help clarify the extent of the contribution of mobile elements to genetic instability in many human diseases. This information is critical in determining the full spectrum of mutations contributing to human disease. However, the full impact of these ubiquitous, high-copy-number elements on the biology of the cell may remain elusive for some time. This article was made possible by grants P20RR020152 (PLD, VPB, and AMR-E), R01GM45668 (PLD), and R01GM079709A (AMR-E) from the National Institutes of Health (NIH) and an EPSCOR grant from the National Science Foundation (PLD). VPB is supported by NIH/NIA grant 5K01AG030074 and an Ellison Medical Foundation New Scholar in Aging award (AG-NS-0447-08). The contents of the article are solely the responsibility of the authors and do not necessarily represent the official views of the National Center for Research Resources or the NIH. Competitive Advantage Funds (2006) from the Louisiana Cancer Research Consortium (LCRC) were also awarded to AMR-E.
All authors participated equally in the conception and writing of this article.